I'd like to thank all these fine folks for giving me their awards. You like me! You really like me! ;-) Seriously though, it really means alot to me, and I deeply appreciate each and every one of these. 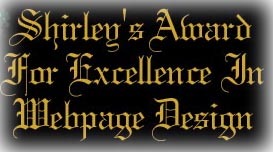 So click on the awards and visit their great sites!